Alfa Romeo's successor to the SZ; the TZ designation stood for Tubular (its chassis) and Zagato. As this name implies, it was a special car with independent suspension all round by coil springs and double wishbones. As sold over the counter it had a 112bhp 1.6 litre engine but that was only the starting point because many of these cars were used for competition and, fully tuned, these would top 150mph/240kmh. Of the 120 Tzs made, ten had fibreglass bodies, which was something of a departure for Alfa Romeo and must have perplexed the vermicelli. 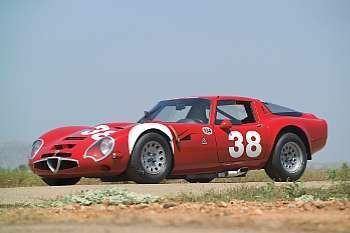 These cars were very successful in competition and when Porsche responded with the 904, Alfa Romeo made the TZ2 which was lower, and was competitive for a little longer.